We don't need your money money money"
Kameron has an overdue fine of 85 cents. Kameron can't checkout if she has a 55-cent fine. Kameron can't pay her fine today. Kameron doesn't get a book today. I am also sad. I spent 10 minutes getting Kameron excited about a particular book, only to find out she has a stupid fine. Well, in my library, she's getting that book anyway. Sheesh. Thankfully, my current school does not charge overdue fines for late library books. But all three of my previous school districts did assess library overdue fines, district-wide, at various levels. One district charged fines to students as young as Kindergarten (5 cents per day). One charged only secondary students: 5 cents per day for middle school and 10 cents per day for high school. The third charged only at the high school level. All librarians have a million things to do and nowhere near enough time to do it. Collecting nickels and dimes all day long, making change, recording that the fine was paid, dealing with the "I didn't return that late" argument, blah, blah, blah. Do we not have enough to do? The book was returned, and that's what matters. To ensure students and teachers knew who still had books out and who had fines, we printed notices each Wednesday and sent them to English classes each period. No joke, we were printing an average of 50 pieces of paper each Wednesday. With maybe 8 students printed on each page. Over a 36-week school year, that's 1800 sheets of paper, or about 3 1/2 reams. At least half of the overdue notices were fine notices, not actual books that were still checked out. Sometimes, teachers fed up with student fines would pay the fine for the students. While I understand the reasons behind it, this really put me in a tough spot. When a teacher asked me to add up all their students' fines and send her a total, I had two choices: delete all the students' fines for that teacher, or allow the teacher to pay it. I don't want the teachers' money; they spend too much of their own money on school and students as it is. Similarly, if I just delete all the students' fines for that teacher, how is that fair for the other students who still have fines? I hated being put in this position, and it happened far too many times. Another tough spot: teachers fussing about my charging fines and trying to get me to check out books to the students because they need them for class. I get it; I really do. I agree with you 100%, and of course, I will allow those students to check out. But again, it's unfair to the other students who do still have fines. If we want to have a consequence for late books (an overdue fine), then we need to apply it consistently. Bending the rules for this student or that student is fine, but overall, charging the fines isn't my policy, and it certainly isn't my choice. I want students to get books, too. Please do not blame me for attempting to follow a policy that I don't agree with and did not create. If you don't like it, raise a ruckus with the district, not me. At the middle school level, students with outstanding library fines were not allowed to attend our version of Field Day. Instead, they were to spend the day with me in the library. While I appreciated my administration's support of the library, I really didn't want to prevent any student from attending a fun event with their friends. This makes the library look like a punishment place rather than a fun place for everyone to be. I usually had the students do some small library chore or light cleaning, then forgave the fine. Still, I hated enforcing a punishment I didn't agree with. "I'm not going to check out a book today. I'm sick of getting fines." Yep, I heard this from students. Phone call from a parent: "Please do not allow my child to check out any more library books. She's getting too many fines." Administrator: "You are always free to dismiss fines if a family can't pay." Me: "That's the thing; they have to tell me they can't pay. Most don't." Instead, they just stop checking out books altogether. I'd rather just dismiss all the overdue fines anyway. 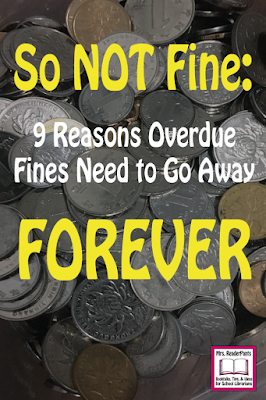 Overdue fines are a barrier to service. One of my most important roles in the school is to match students with resources. If a student can't checkout because his fine is over 50 cents, then that prevents me from providing the service I am trained to provide. Further, collecting nickels and dimes all day long is a huge waste of my time. Yet a significant portion of my day was spent counting, collecting, and tracking fines that were, in many cases, less than a dollar. Does your school charge fines for overdue library books? What are your experiences with them? Do you think they help bring books back more quickly, or are they a barrier to service? As a librarian, I made the choice to let students check-out books even if they have a fine. I also offer ways through-out the year to take care of the fine without involving money. I do believe we are teaching responsibility, because for a few years I didn't have fines, and I was having a difficult time getting my books back for others to read. I don't charge fines but I can't get the students to bring back their books. I will still allow them to check-out a book even though they have a lost book. I offer them the chance to come and work in the library to pay it off. I never make them work over 15 minutes and 3 days of 15 minutes is about the most I've ever made a student work. I just want them to show some responsibilty. I am in a middle school. What could I do to get the books back? I agree completely with your post. The first thing I did at my current school was to remove the overdue fines. I have weekly emails generated to go out every Monday morning to parents of students with overdue materials. Seniors can't get their diploma if they still owe library materials, so I figure they will all have to settle up by their graduation. I also let students check out books even if they have an overdue book. Of course there are always some problem students who we don't let do so, and if a student has multiple overdue books we won't let them do so, but to just categorically say no student who has an overdue book can check anything out is quite punitive. In my previous school we often negotiate. If a kid wanted to check out a book but had several overdues, that would often lead to a discussion about where the overdue books were, and I would often send the students' parent an email telling them I just spoke to their kid and they told me the book was on their shelf next to their bed, asking the parent to remind the kid to bring the book back. In those cases, the books often came back the next day. I would also negotiate with a kid with multiple overdues, and say I couldn't let them check out a book with three overdues, but if they brought one of them back then I would let them check out another book. This often resulted in immediately getting at least one of the overdue titles back. We should all be about giving our kids the most access to materials, not restricting their access. I hate dealing with fines and their aftermath, but unfortunately, it is our source of revenue for the most part. We receive a very small budget each year and the fine money truly helps us to buy books that kids do want. I feel better charging fines knowing that it is in turn helping the library. If my budget were bigger, I would easily give up charging fines. My other issue is that as a secondary librarian, I am not getting my students "college and career ready" by not holding them accountable. Every college and public library has some sort of accountability; we just mimic that. I've really been mulling this one over since I started at a middle school in January. I'd really like to not do fines next year. We still make lots of $ from students printing in the library and I hate having to charge kids, or worse, not let them check out since they were 3 or 4 days late. Also, we're in a fairly high poverty setting, and I feel like a barrier to service (as you said) is the last thing I need to promote as their librarian! So this is our policy, our students can issue as many books as they can look after for 90 days, once the book is overdue then they can't issue anymore out until the others come back. The only time we charge students is if the book is damaged or they still have outstanding books at the end of the year which they have probably lost. Forgot to say we had the lowest amount of overdue books every last year after introducing this policy. It took the pressure off the students to have their books read and returned in 3 weeks, and the pressure off myself and the teachers to constantly chase the overdues. I've never charged fines, but students with overdue books can't check books out. I have a shelf of donated paperbacks they can borrow, so they can always have a book; responsible students get better choices. We have a limit of books a student can check out according to their age. 5 YO - 1, 6 to 8 YO - 2, etc. When books are over due they are not able to take new ones till overdue ones are returned. After being refused (kindly) checkout, they usually bring their books in the next day. We only charge fines for lost or overdue books. We withhold checkouts until the lost/damaged books is paid for, but only up to their limit. So a 6th grader may owe for a lost book, but still be able to check out 2 more as their limit is 3 books. We withhold the report card and that usually gets the parent in immediately to pay for a lost book!!! Try this!